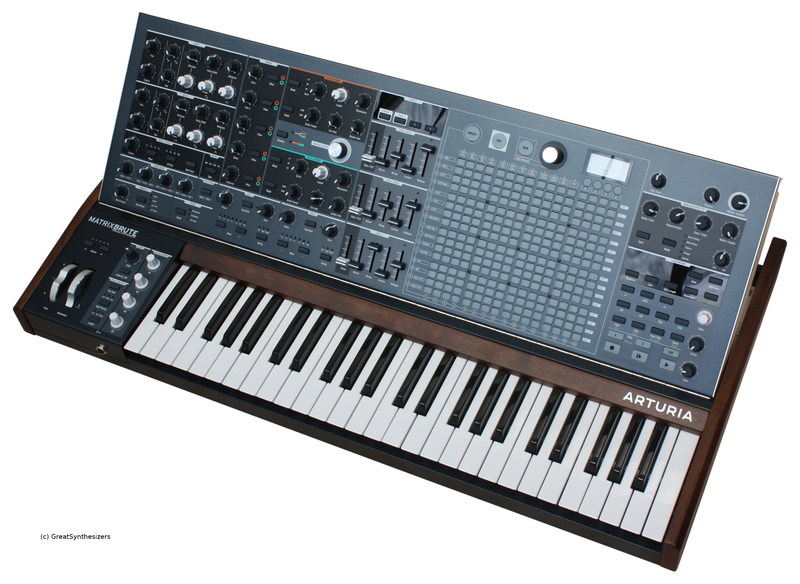 Arturia MatrixBrute – a fabulous instrument. This synthesizer, available since the beginning of 2017, will some day count among one of the REALLY BIG instruments of the decade. 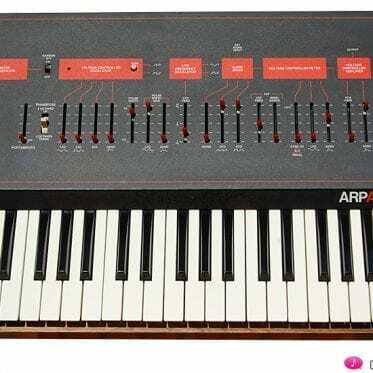 A TOP synth. Assuming, of course, that „Made in China“ is no big obstacle. At the moment, we find no such detriments to its quality. In fact: After presentation of the prototype in 2016, Arturia even did a little additional pepping up … now the synth has gorgeous aluminium wheels instead of those original plastic wheels. And since its recent software update (mid 2017) – others are certain to follow – the MatrixBrute is about as perfect as you could even wish. „Perfect“ is not a helpful definition, of course. Perfect is in the eye of the beholder, so to speak. It’s like this: you sit down at an instrument and you want to – SURPRISE – make music! You don’t want look around for functions (you want to find them), you don’t want to have critical thoughts about the hardware, you don’t wanna end up in a musical dead-end shortly before you reached your goal. 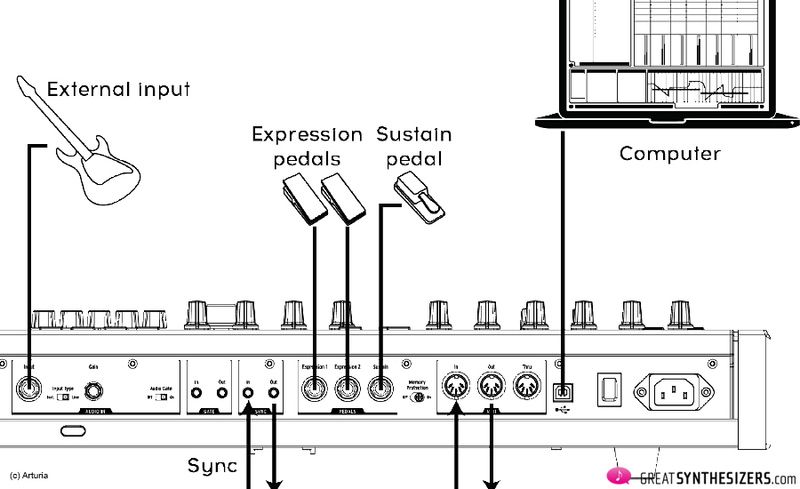 And nobody wants to have to leaf through some substandard user manual … one just wants to sit down and make MUSIC. This is a report on just such a happy experience. Our partner is the MatrixBrute. Unpack it, set it up, plug it in. Sit down and work your way from one end of the synth to the other. Two glances at the little (but well-written) user’s manual – and off you go. Here at the left you can adjust the oscillator beats, the knob down there is for osc synchronization. Direct recording of sequences via the keybord? – no problem. Replaying patterns via START? Transposing patterns via HOLD? 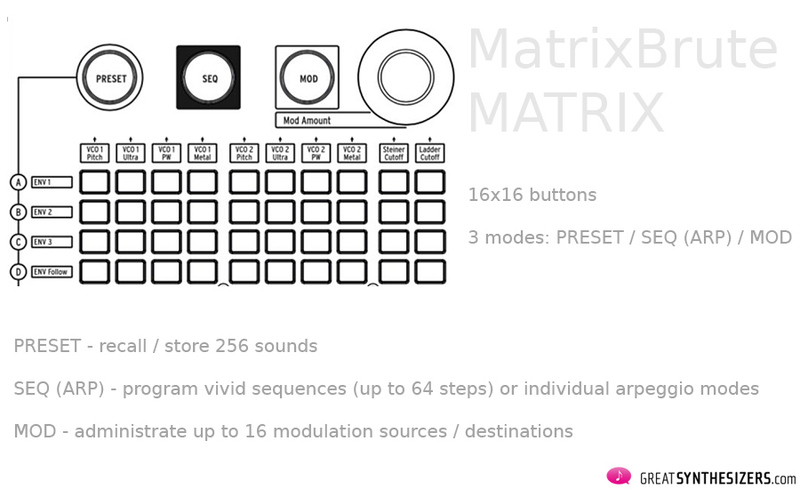 Modulation routings easily done via the fabulous matrix (16×16 rubber switches)? Direct access to filter frequency via the aluminum wheel? It’s all there. EVERY attempted change in sound and performance suceeds on the first try. Even speed-modulation of the two LFOs is absolutely no problem (e.g. by the extra ENV 3, a short glance in the manual makes it possible). Grand MatrixBrute. We have to admit: The above approach is not really to be emulated. The manufacturer specifically asks for concious study of the manual before turning on the instrument. We nod guiltily and promise to better our ways. Perhaps we can make amends by proposing that this „MatrixBrute-Kick-Off-Test“ works just as well: Sit down and make music. Mission possible! Everything about the MatrixBrute is spectacular. So let’s begin with the GIVENS. And what these mean in reality. 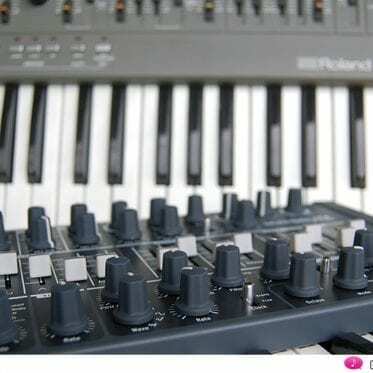 The MatrixBrute sports 256 presets. We tend to think that this is peanuts. In times like these, when many instruments offer thousands of sounds (something that could be more frightening than reassuring, let’s be honest), 256 presets doesn’t sound like much. This is where the matrix comes in. It makes apperent, how „many“ sounds 256 sounds really are. Let’s assume that we’re not talking about just any sounds, but in fact about really good sounds. About sounds that require a lot of time to create. Something which, in case of the MatrixBrute, should be self-evident. All those sound-parameters, all those modulation possibilities, here the sequencer (and the arpeggiator), there the analog effect section, then further extras … all a question of time and effort. Which means, programming a good sound (including powerful performance adjustments) is not a question of a few minutes, but rather of one or two hours. Now, let’s imagine you create ONE sound every day of the week. You rush in from work, sit down at your MatrixBrute, and off you go. You have weekends and holidays off (of course), where you can play and enjoy your sounds without a guilty concious (or spend some time with your family, whatever …). 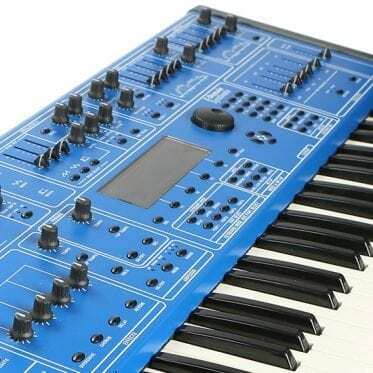 But aside from this, you create new MatrixBrute sounds from Monday to Friday, one per day. If you’re rigorous about this, filling the synthesizer with your own sounds should take you ONE YEAR, plus – depending on holidays and where you live – up to an additional 6 days (or so). One year’s work for 256 sounds. Impressive. Considering ALL of it is impressive, what would be a real MatrixBrute highlight? 3 VCOs and 3 LFOs (if using VCO3 in low frequ mode), for example. As are 3 envelopes. And: each of the 5 audio sources can be individually routed to the Steiner- and/or the Moog-VCF. Both VCFs can work parallel and/or in series. There are four (!) types of noise are available (white, pink, red and blue). The pitchbend-area is programmable up to one octave. 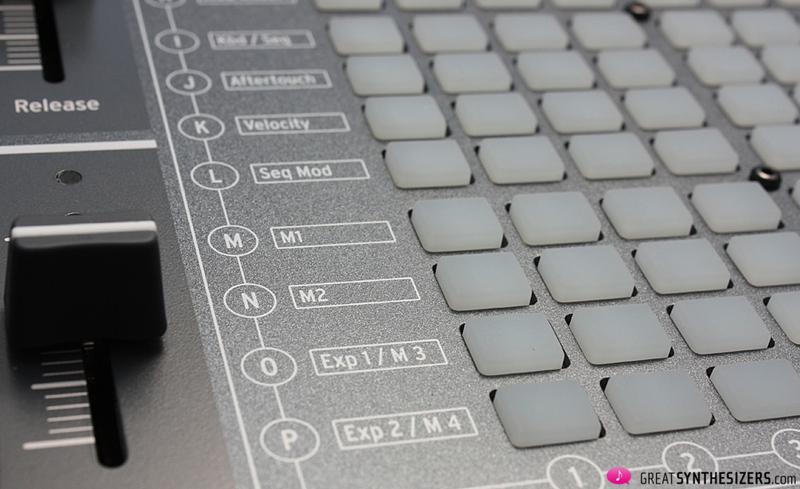 The Mod Wheel can control every parameter of the MatrixBrute (via the modulation matrix assignment). 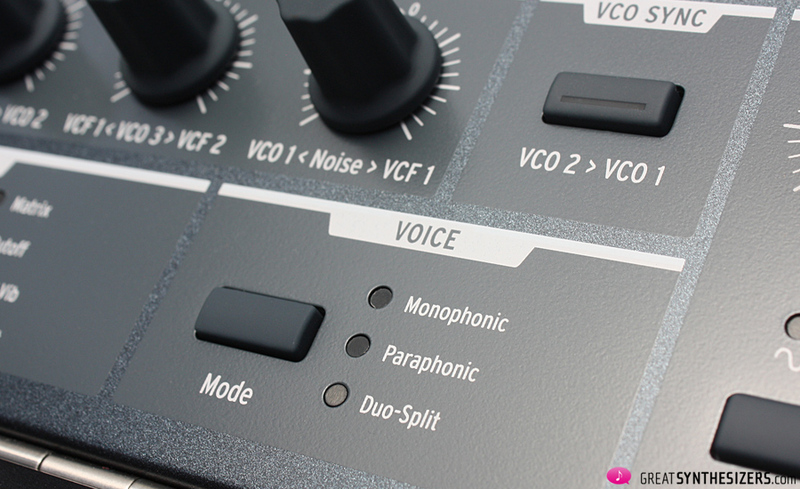 The entire synth can be turned into an independent 2-voice package, with a programmable split point. Example: The left side of the keyboard runs a sequence, while the right side of the keyboard can be used for lead sounds – duo-timbre in real-time! Nearly no wish goes unfullfilled regarding the sound architecture. 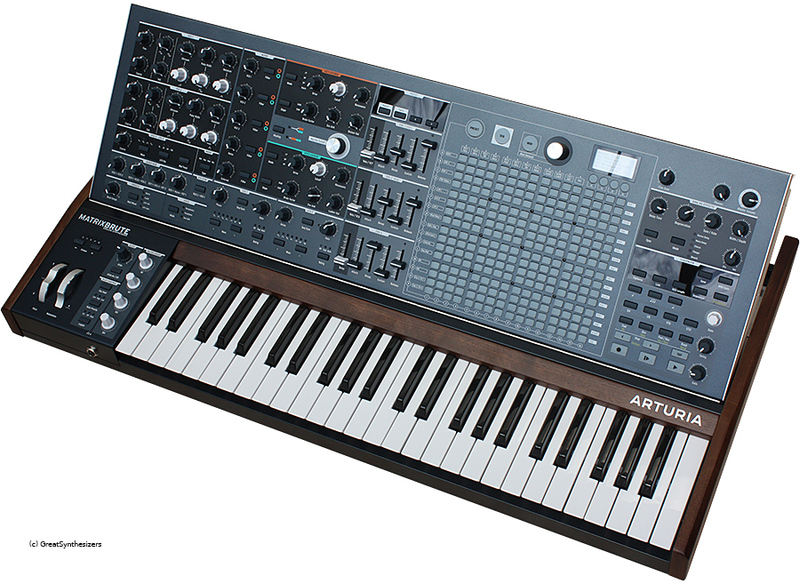 In fact, the player – confronted with a huge mass of possibilities – may find himself yearning for the simple Arturia MiniBrute and MicroBrute of earlier days. A quick look at the team that assisted in bringing the MatrixBrute to life may help us to grasp the magic behind the instrument. 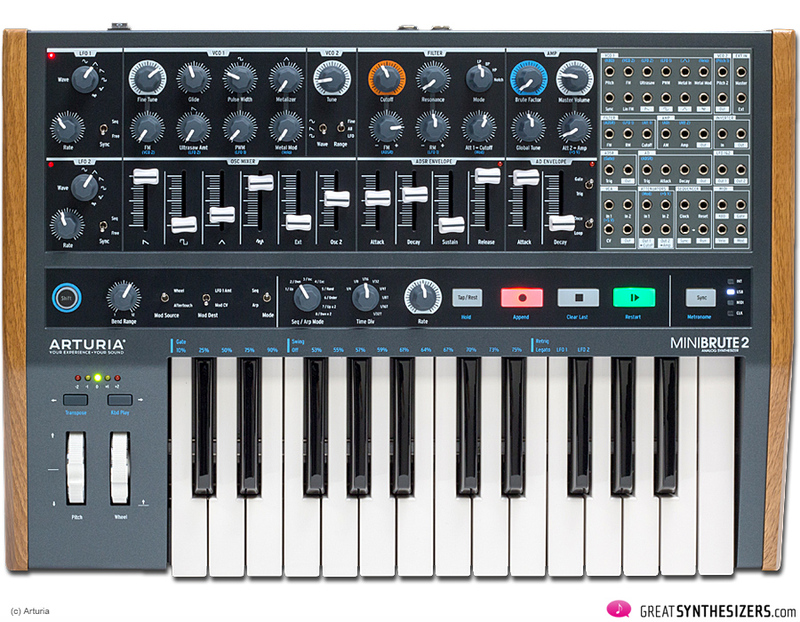 Well-known and generally highly appreciated: the versatile Arturia VCO. MatrixBrute has two of them, as well as an extra (3rd) VCO / LFO. 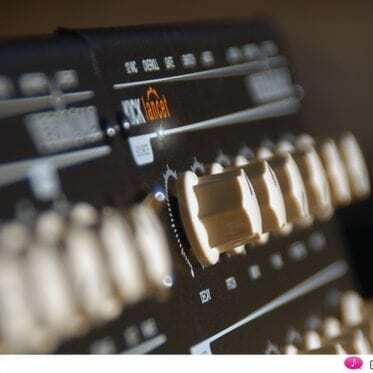 Each of the main oscillators sports impressive goodies that you might know from the MiniBrute / MicroBrute (mixable waveforms; ultrasaw-, PWM-, metalizer-option). There are also 2 strong sub-oscillators (sine or pulse wave), for those deep low-ends in sound. 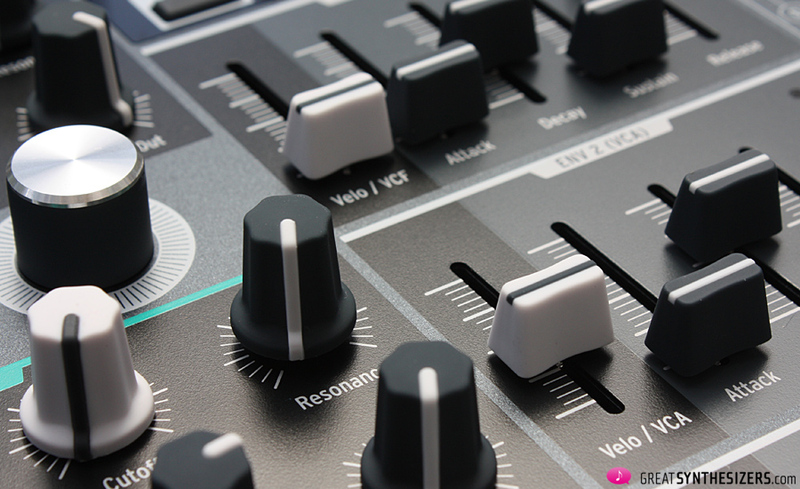 Heaps of knobs to help you find just the right timbre. 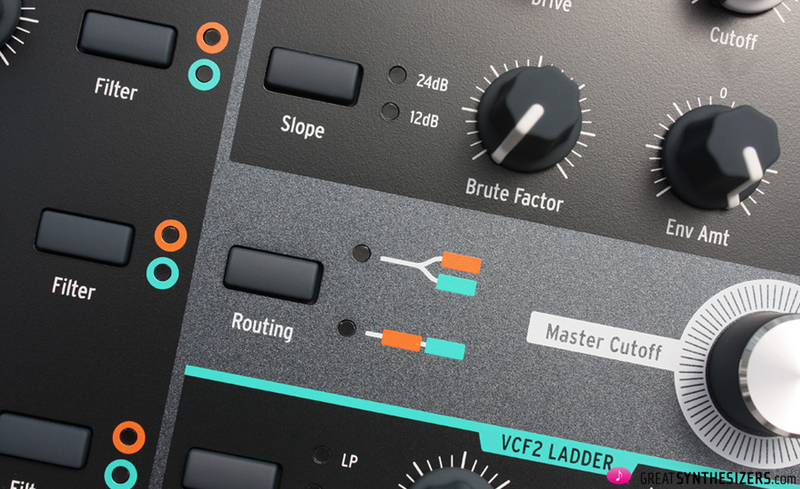 Finally, the mixer section allows for the adjustment of volume- and filter-routing for the 3 VCOs, together with EXT (IN) and NOISE. 5 audio signals, so to speak. A great subtlety offered to the in-depth sound-designer: the AUDIO MOD corner. VCO1 can modulate the pitch of VCO2 (frequency modulation – FM). 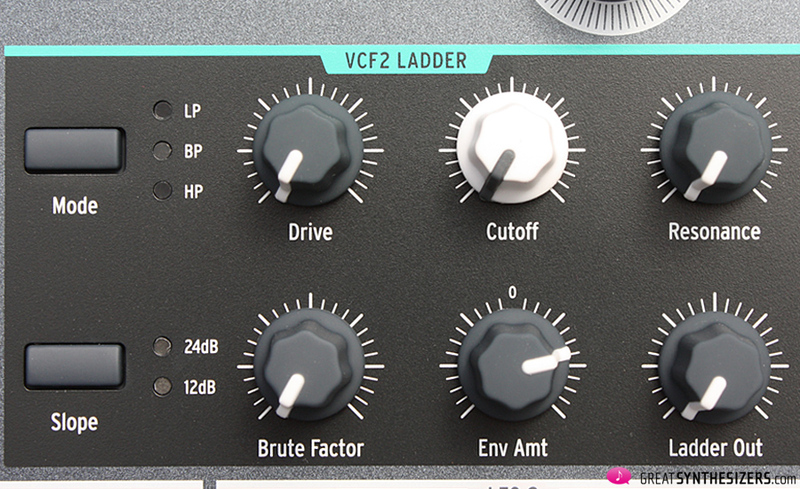 VCO3 can be used for FM, too, modulating either of the two main VCOs and either of the two VCFs. Finally, there’s noise-modulation (for VCO1 or VCF1). 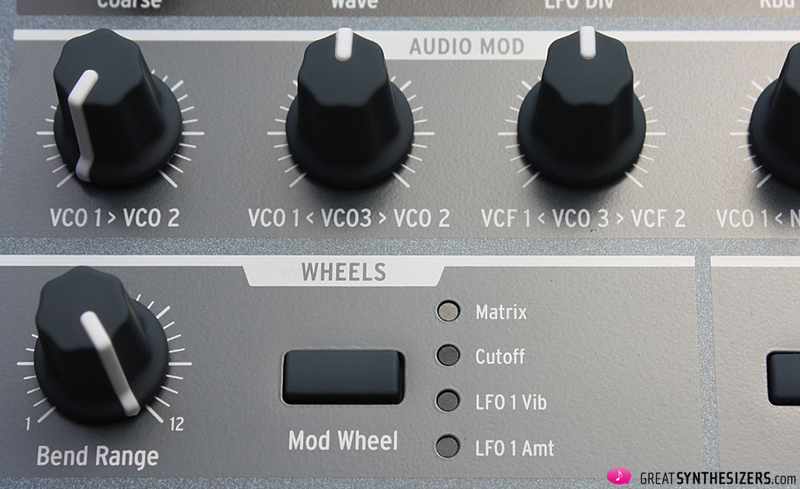 In the modulation matrix, each AUDIO MOD knob can be specified as a modulation source, so that – for example – velocity may control the amount of VCO3-to-VCF2-frequency modulation. Heavy stuff. The two multimode-filters can be used separately, in parallel or in series. 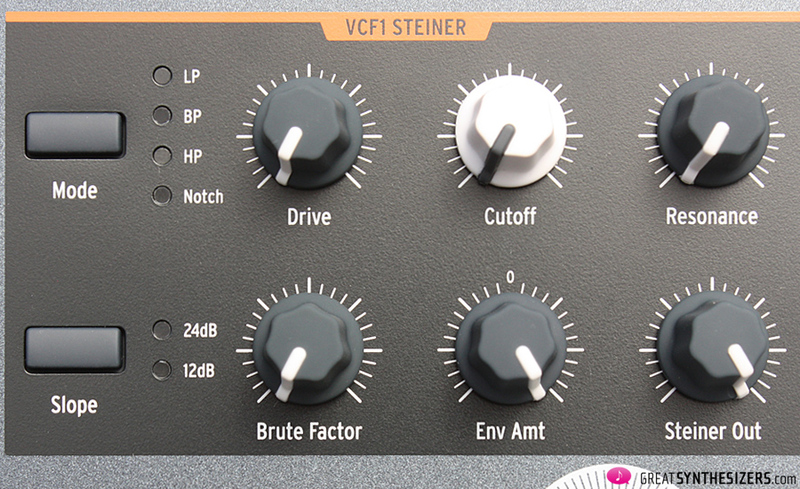 Besides frequency, resonance, envelope amount and output volume, each VCF sports the famous BRUTE factor and DRIVE knob. Finally, a common (and very eye-catching) aluminium rotary wheel allows the simultaneous control of both filter frequencies. Superb! Well, both envelopes 1 and 2 are standard: ADSR. Each of them comes with a fifth slider (white top) that allows the simple (but effective) adjustment of envelope modulation via velocity. 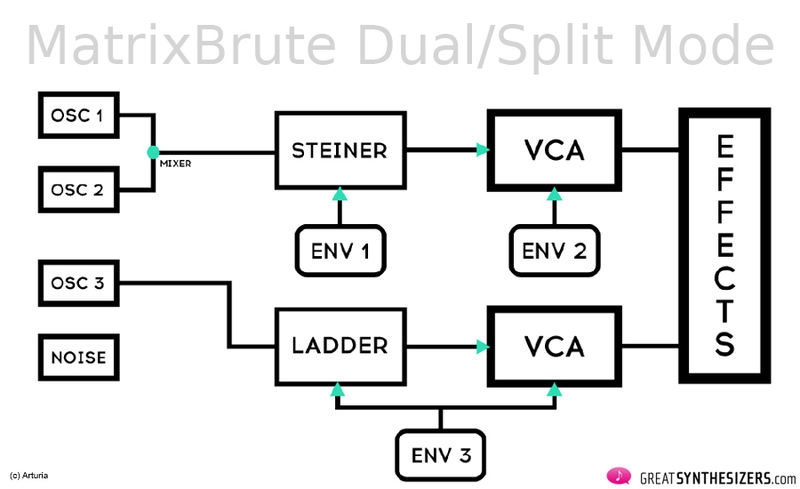 Separately adjustable for VCF and VCA. Very important for that bit of extra “organic timbre” in the sound. 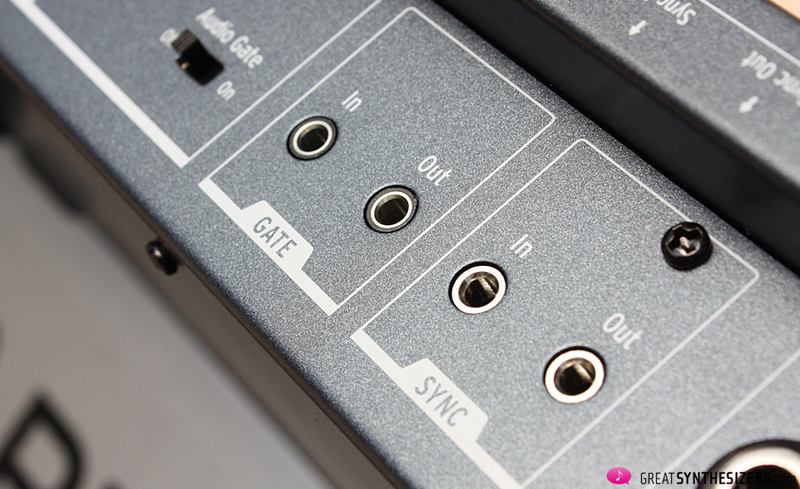 LFO re-triggering can be set to OFF (standard, we guess), SINGLE or MULTIPLE key trigger. 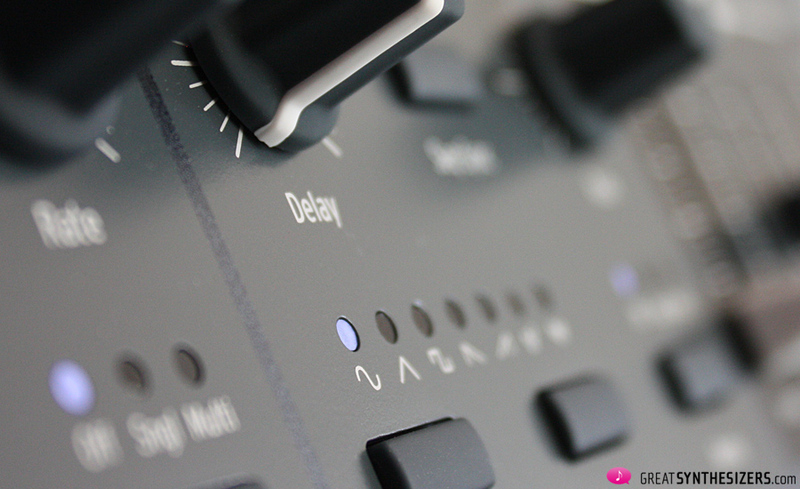 LFO1 offers a knob for PHASE shifting, LFO2 has an extra DELAY control. The range of the main LFOs is from “1 cycle per 18 seconds” (veeery slow *) up to “100 cycles per second” (100 Hz). 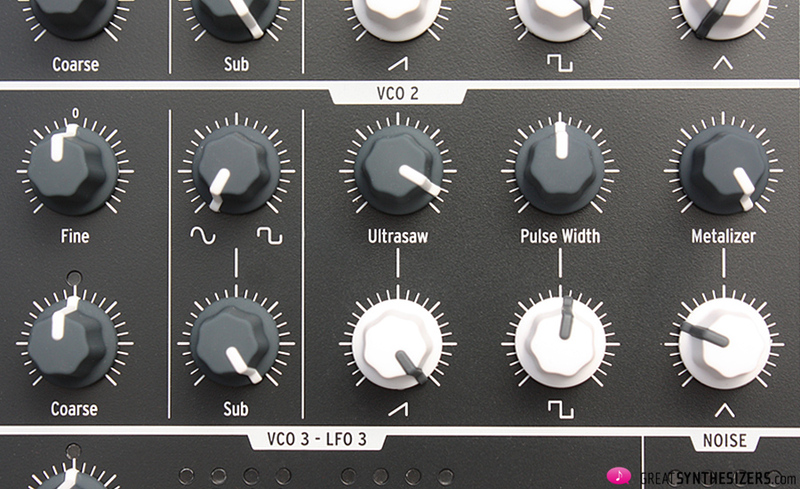 The third LFO (alias VCO) is that powerful low/high-frequency oscillator we met in the AUDIO MOD section. 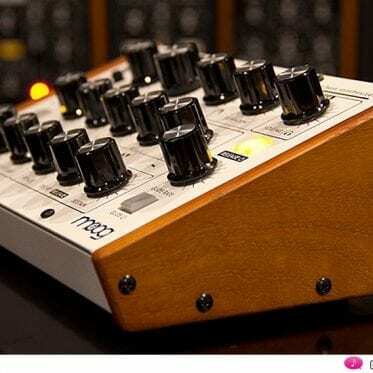 It massively extends the sound spectrum of the MatrixBrute (“FM” and other experimental happinesses). Excellent: (mono / stereo) delay, flanger, chorus, reverb. 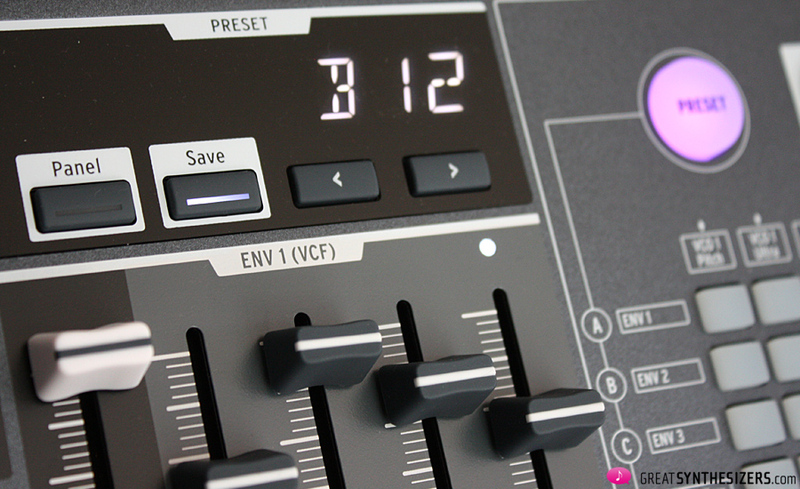 A simple, yet very user-friendly section with a few (decisive) controls. 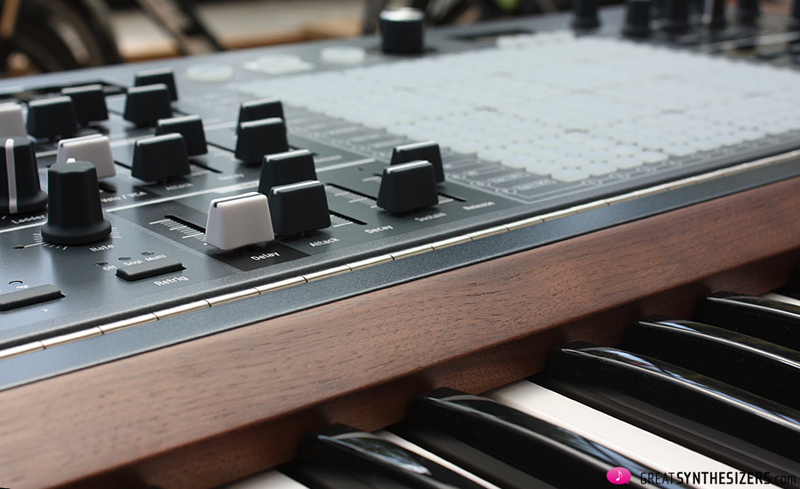 Contributes a lot of character (and a bit of warmth) to the overall MatrixBrute sound. Responsible for some unique music performances, especially in combination with the internal step-sequencer (call it “synchronization”). Here’s the brilliant Matrix procedure. 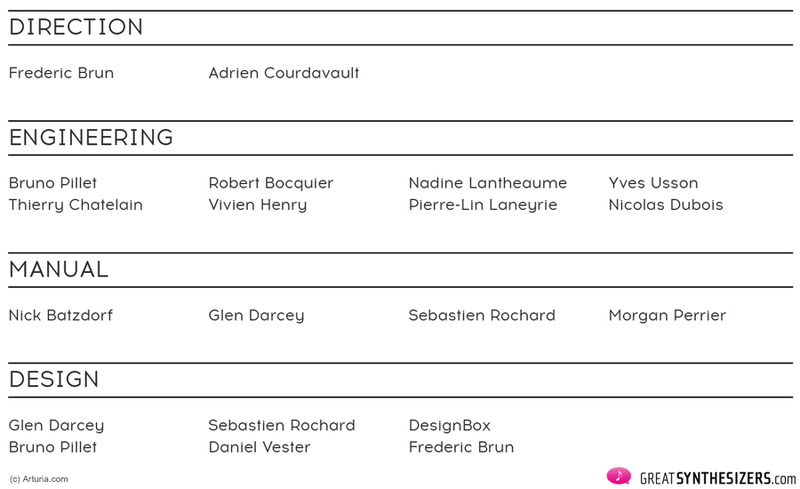 Voilà. 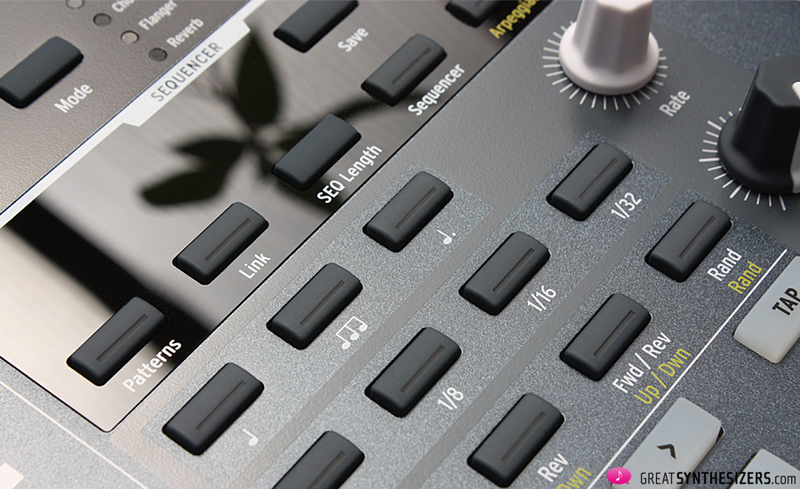 Press PRESET and select sounds, press SEQ and create patterns, press MOD and set your modulations. PRESET has already been considered on that philosophical note (“one year of work,” as you probably remember). 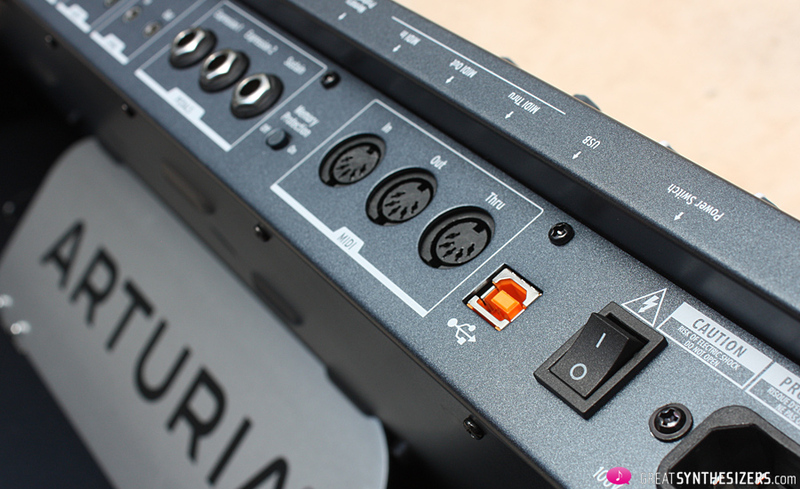 The SEQuencer compartment contains a 64-step recorder with 4 tracks (note, accent, glide and mod(ulation)). Excellent. Each of the 256 patterns can be connected to any sound simply by pressing LINK. 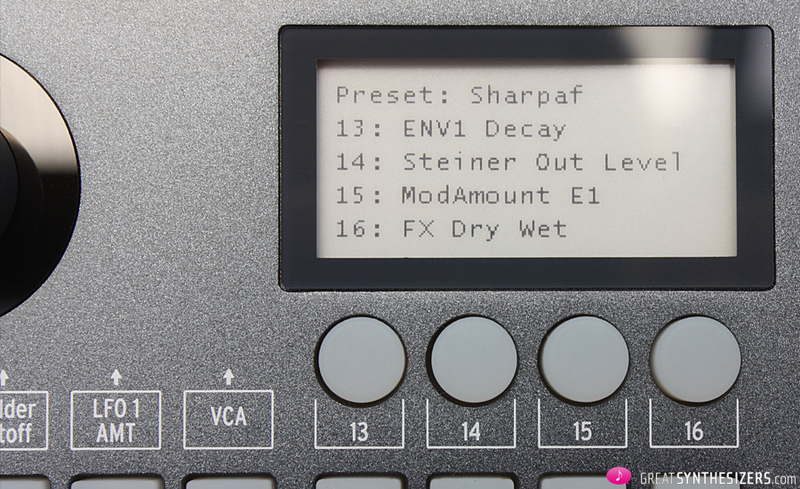 The ARPeggiator is hidden somewhere in the SEQ area. And it can – you’ve probably guessed it – do more than plain arpeggiation. 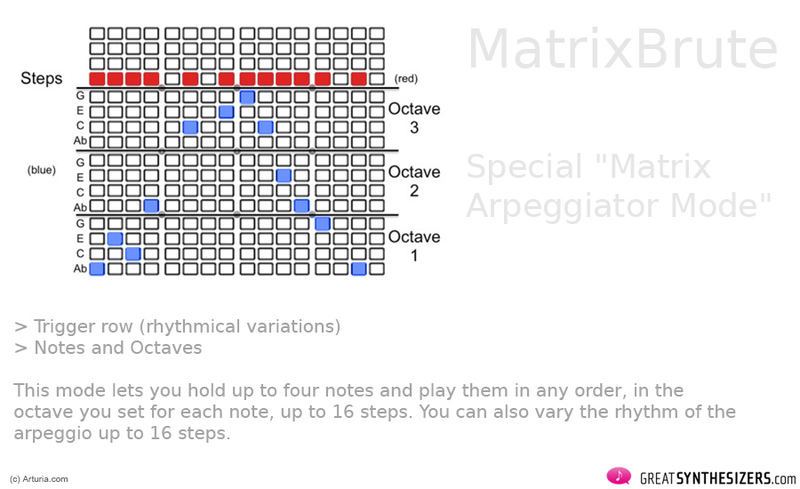 The “Matrix Arpeggio Mode” turns the Matrix into an clever arpeggiator programming tool, with separate rows for trigger and notes/octaves. A brilliant idea. The two aluminum wheels (each with a little “A” – Arturia emblem on the inside) are a pleasure to use. 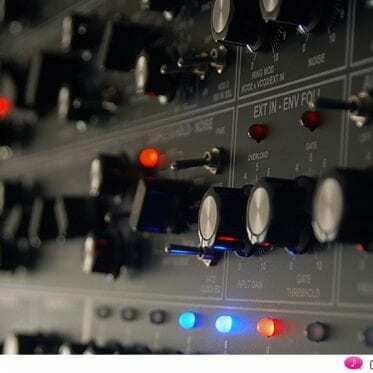 The pitch wheel is – as we said before – programmable (up to one octave), as is the Mod wheel – assignable to the Matrix, the global VCF cut-off, LFO1 Vib(rato) or LFO1 Amount. Fiddling around with these wheels just tops things off. In an “ideal” world, Arturia would have added a beautiful ribbon controller as well, tastefully integrated into the wood. But we have to be fair: Regarding the extremely fair price of the MatrixBrute, there’s no room for even more wishes. Four macro controllers round off the performance section. 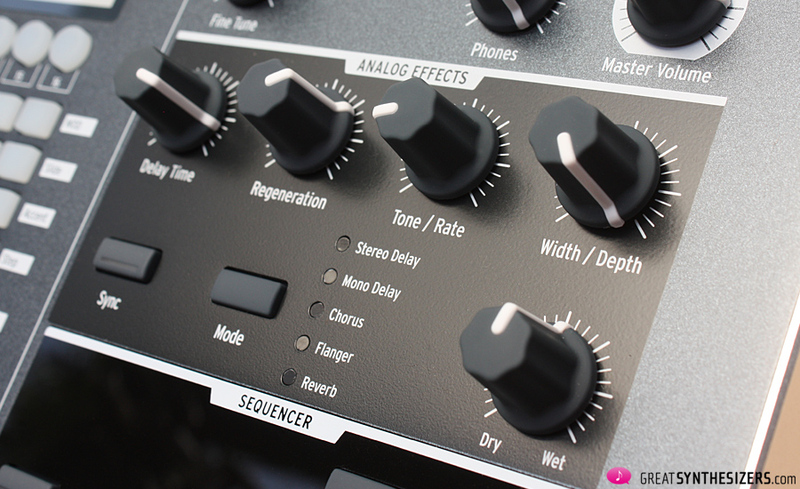 Freely assignable, each knob can control up to 16 modulation destinations at once (matrix mod programming). Equally ingenious: the comprehensive CV/Gate connections and assignable pedal inputs. Great praise! Then there’s the MIDI Control Center, actually a MatrixBrute “Total Control Station”, available for free download at the Arturia website. 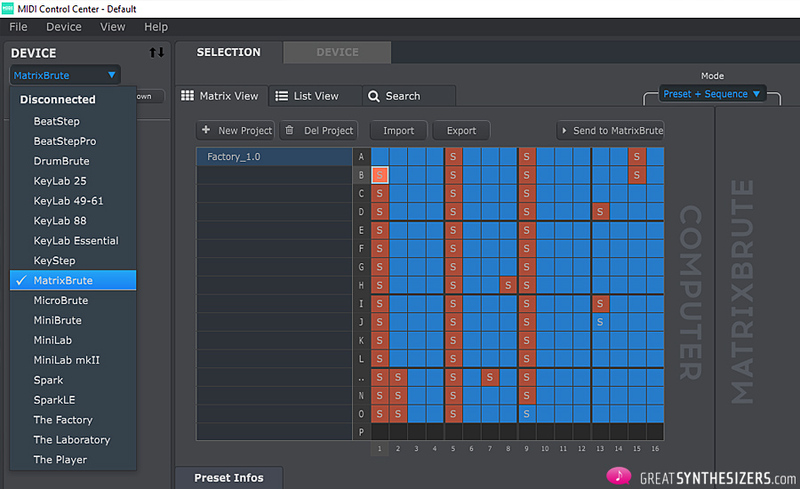 The software might also serve as an advertising platform of sorts, boosting useful monitoring-, control- and storage-possibilities for 18 Arturia instruments (to date). Chasing after all the little bites and bytes seems a bit finicky. Not just with the MatrixBrute. It’s a question of a musician’s personal attitude and work preferences. Almost as if spontaneous, unexpected things in the acoustical landscape could put a warp on one’s overall musical image. Be that as it may: those of you who need complete digital control will be pleased to see that it’s all there, one way or the other. All MatrixBrute knobs send MIDI CC data! 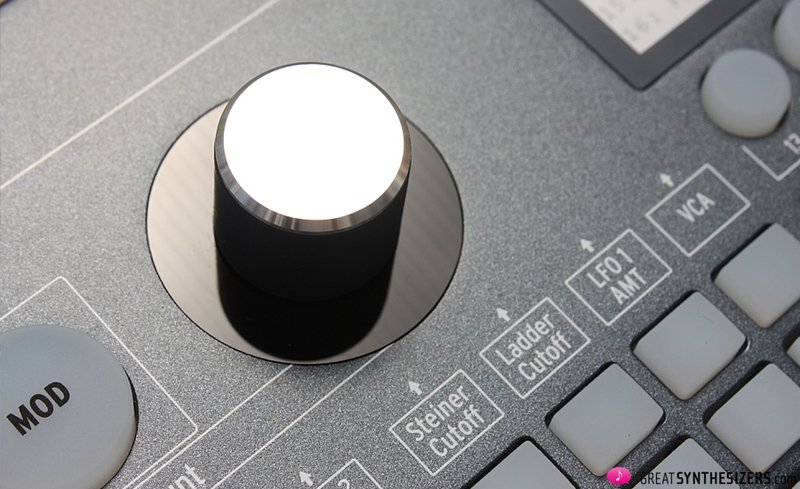 But the nice thing is that TOTAL CONTROL is neither prescribed nor necessary for your MatrixBrute workflow. That little display just indicates the preset name and the 4 macro controller assignments – above and beyond, it remains pleasingly uncommunicative. Because you don’t need more than that. Wheather or not the velocity intensitiy is exactly right, whether the length of the decay tie is exact correct, whether or not the mixture of the VCO waveforms could be refined by this or that nuance – all of that is something your EARS are responsible for. Because listening to the sound and tweaking knobs in realtime remains the most intuitive (end effective!) 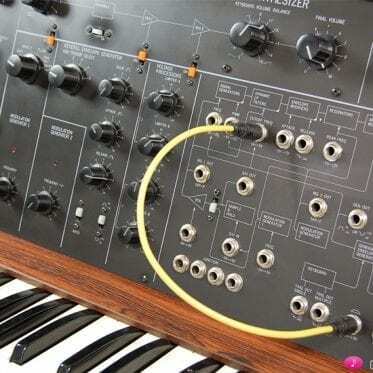 method of playing analog synthesizers. Thank heavens for Arturia’s insight. Meaning both worlds can be satisfied. On the one hand, the live keyboarder has his spontaneity (without being distracted by continualy changing information on the display, e.g. permanently varying menues). On the other hand the picky bits- and bytes-freak has total control via computer and MIDI CC, illuminating every tinyest corner of his acoustical material. Fantastic. Quality and weight often go hand in hand in (musical) electronics. Old hat, but true just the same. The revelation begins with the unpacking. 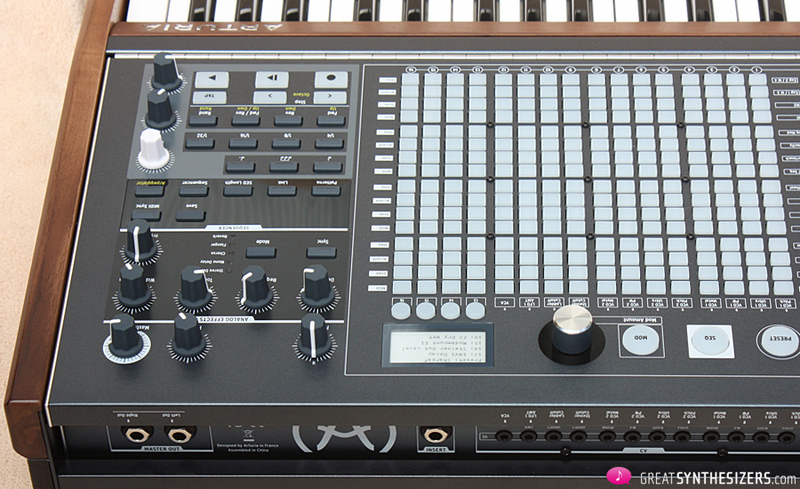 This MatrixBrute just has to be very good, weighing, as it does, 20 kilos! 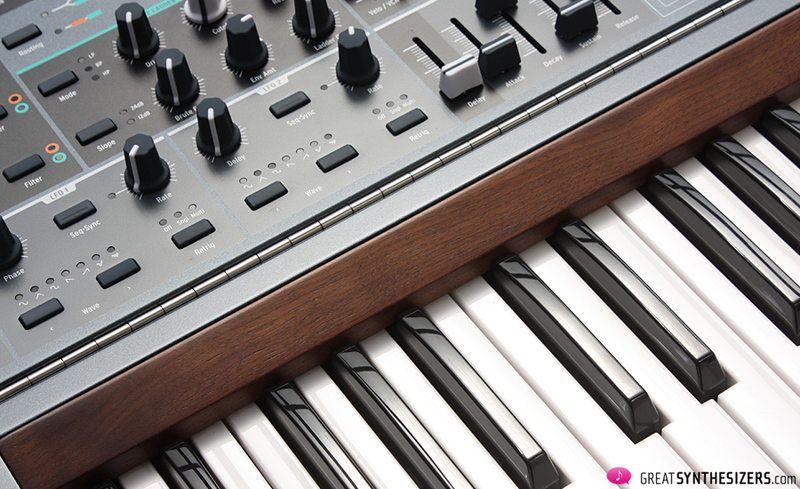 Beautiful, solid wood (fortunately real wood), a heavy metal chassis, solid knobs and switches, generous faders. The MatrixBrute makes you happy before you have even heard it (and after that all the more). A beautiful instrument automatically commands great respect. While gingerly unlocking, lifting and adjusting the panel, carefully connecting the cables and thoughtfully slipping on the power switch, the eloquence and elegance of the MatrixBrute is irrestistable, impossible to ignore. Which brings us to the one question we are not able to answer: Assuming respectful use, how durable is „Made in China“? On the one hand, „Made in China“ these days implies a very high level of (hardware) quality. It‘s probably high time to get rid of some old prejudices. On the other hand, we do know of some cases where the MiniBrute (loose keyboard metal plates) and the MicroBrute (constant tone signal, impossible to make it stop) have been known to wander off to the eternal hunting grounds after only 18 months. Our dire wish is that the MatrixBrute will give us many (many, many) years of acoustic pleasure. A long life seems only fitting for such a special instrument. First, a question: Considering the assets of the MatrixBrute, can’t we just throw a lot of those other instruments out there over board? In a way, yes. But on the other hand, a (new) Minimoog is (and remains) a (new) Minimoog and a GRP A2 is (and remains) a GRP A2. Both of which are not obsolete. There are other examples, but these two instruments demonstrate the neccessitiy of spending some thoughts on the SOUND of Arturia’s latest flagship. So back to our objects of comparison. With 3 VCOs and a ladder, the MatrixBrute should get close to the Minimoog sound ..? Wrong there. And with 2 VCOs and the Steiner VCF (notch!) you should get close to the GRP A2 ..? No chance. This is – to be on the positive side – good. Allthough the MatrixBrute is a magic box par excellence, it does not replace every other instrument. Its strengths are there where it is 1000 % right: flexibility and musical performance. Warmth, on the other hand, is not one of its strengths. Creamy oscillator-phasing and ultra-snappy envelopes are just somehow creamier and snappier with other instruments. 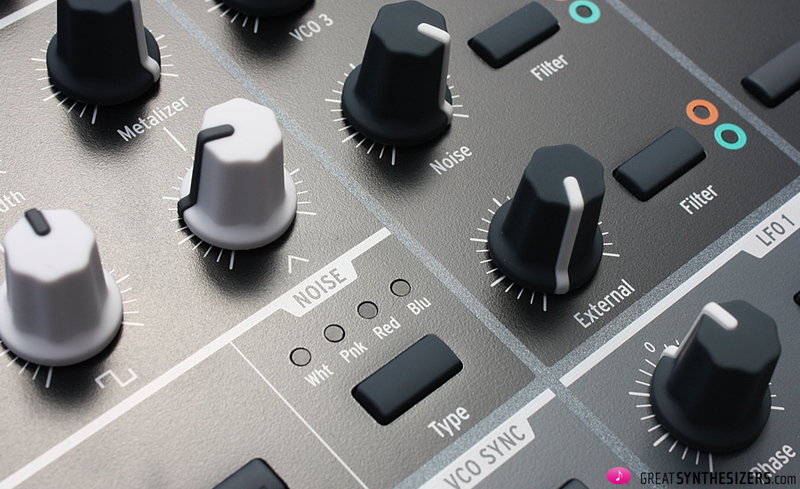 In other words: The MatrixBrute is not an analog beast, it’s a synthesizer with a straightforward, modern analog sound. 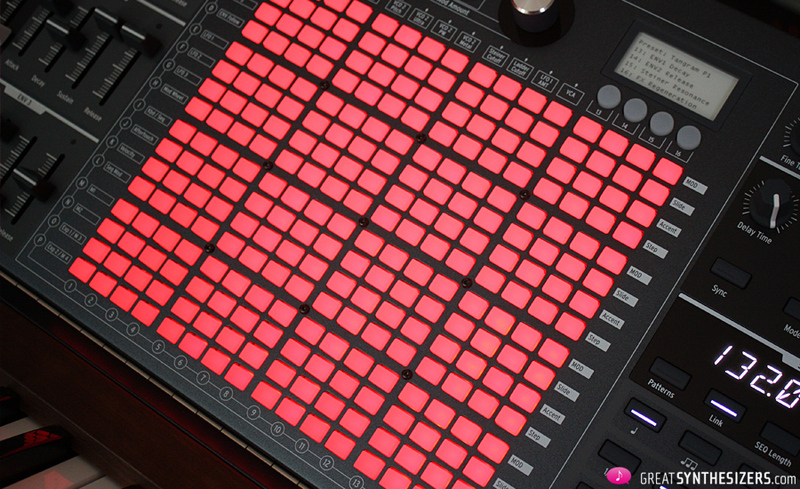 … the final touch is when you employ the sequencer (arpeggiator) and the genius modulation matrix. It’s at this point that the MatrixBrute mutates into a perpetuum mobile – a self-propelling musical machine with nearly endless possibilities. Then (and only then) does the MatrixBrute mutate to something unique. To something you become addicted to. 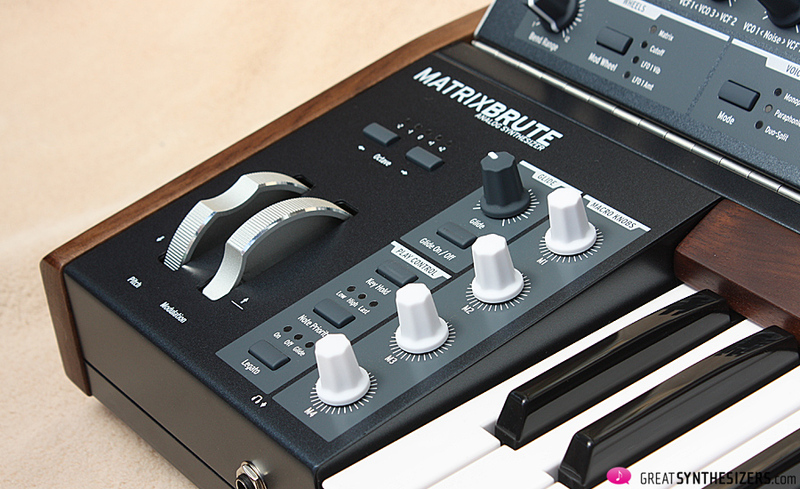 Now, the ultimate “crowning glory” is – in our opinion – the MatrixBrute’s analog effect section. Start the pulsating sequencer, add some (stereo!) delay, turn up the feedback-loop and listen to the MAGIC, to the aural excitement that surrounds you. It’s a world of its own. 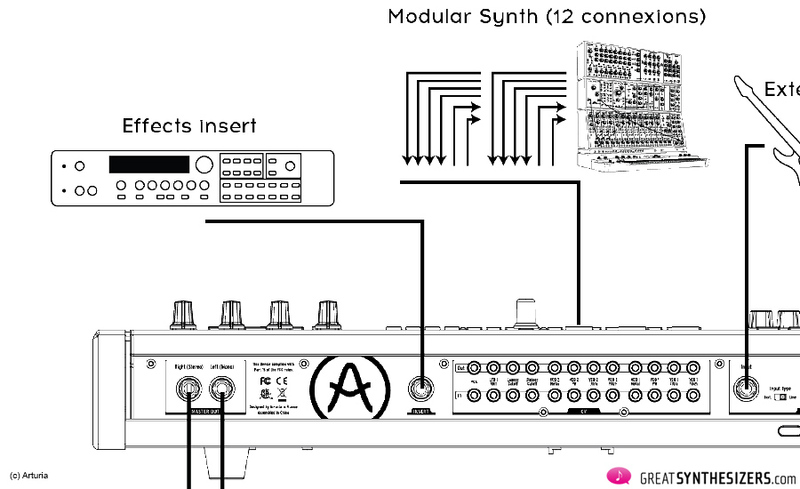 In the wink of an eye, the MatrixBrute will be the heart of your studio: Self-sufficient, thanks to the sequencer-plus-analog-effect-package (… just take a seat, plug in your headphones and off you go); A centre of analog/digital communication, thanks to MIDI, USB and that vast cv/gate panel. * The musical results are astounding and – with or without „warmth“ – first-rate. First (performance): Switching from one sound to the other causes a short “dead point” – a split second, in which nothing happens (no sound). This minimally blocks the overall performance. 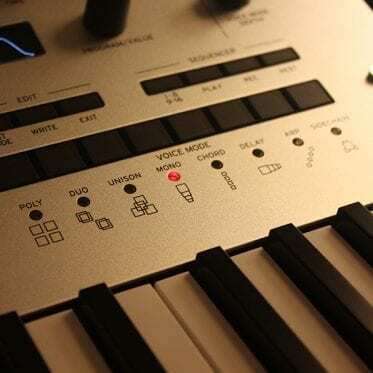 Third (audio quality): The output signal of the MatrixBrute is a bit noisy. “A bit” means a bit more noise than a studio device should have. Performing the MatrixBrute LIVE you won’t be aware of the mediocre signal-to-noise-ratio, but in the studio (recording several MatrixBrute tracks and listening to the results carefully), the noisy audio is clearly audible. Who knows? 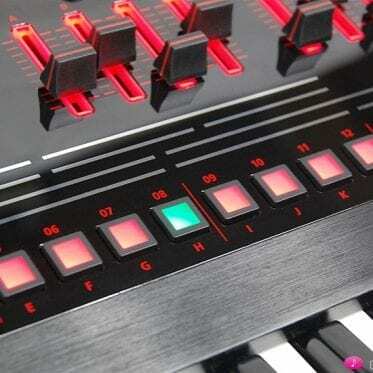 Maybe the MatrixBrute will advance to the „synthesizer of the decade“. Its amazing concept enables it to do everything and to be everything. It’s as simple as that. Taking into account the philosophy behind the Matrix (256 presets = one year’s worth of sound design) and the above-discussed descriptions, it is an instrument par excellence. Attached: 50 minutes of MatrixBrute sound samples. 95% of what you hear is pure MatrixBrute. In one file (DEMO 1) the GRP A8 contributes a stereo sequence (for that extra “warmth of sound”), in another file (SOLO paraphon) an Indian drum computer (Electronic Tabla) adds, well, some Asian percussion flair. All other sounds are pure Arturia. 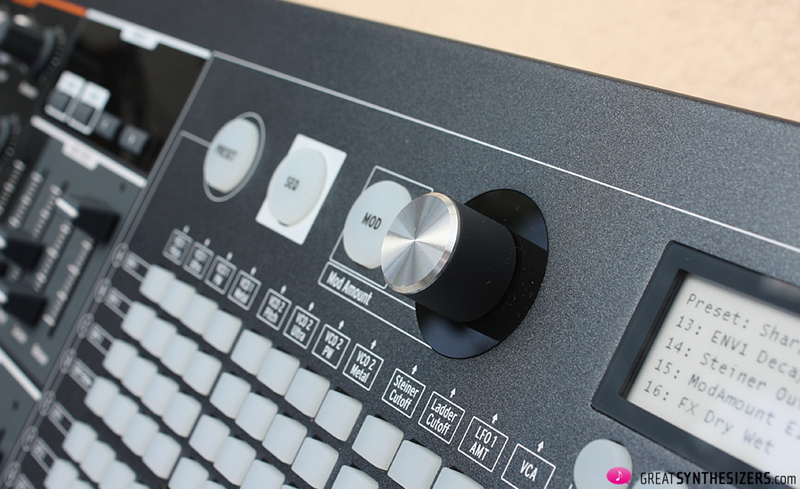 All performances done directly on the MatrixBrute, with the use of the internal sequencer and those great internal effects, and – once or twice – an external reverb, the Quantec QRS. Enjoy. Nice test. I agree with you on everything you say. … thanks for the link ! Excellent review and great sound demos! Where did you locate the white replacement knobs? They look perfect!